There are many stop snoring exercises that you can try. You’ll learn about some of them here. For those of you that snore and are overweight, it is important to understand that your weight problem is a contributing factor. So, if the movements here are ineffective, you might try changing your diet or becoming more physically active. The goal behind these movements is to strengthen or tighten the tissues of the soft palate. A snore is actually the sound of the vibration of the tissues, which are located at the back of your mouth, neasr the opening to your throat. The movements should also improve the strength and rigidity of the throat muscles which could be beneficial for sleep apnea. People who snore often can suffer from sleep apnea, too. In apneas, the muscles of the throat relax to a point where they interfere with breathing. If your sleeping partner says that your loud snores are followed by periods when you appear not to be breathing, you could have sleep apnea. Singing often and loudly is a fun stop snoring exercise. Losing weight helps with apnea too. The problem is sometimes caused by fat deposits around the throat that basically strangle you. There are three kinds of stop snoring exercises that are beneficial. They are moving the whole face, focusing on the lower jaw and exercising the voice. This stop snoring exercise is also recommended for firming the skin of the neck, which could help to reduce wrinkles and “double chins”. Sit in a straight-backed chair and tilt your neck backwards to gaze at the ceiling. With your mouth closed, pretend that you are chewing a piece of gum continuously for about 20 seconds. Chewing gum is sometimes recommended for exercising the jaws and facial muscles. But, it can put undue stress on the jaws. This exercise emulates the movement, but is easier on the jaws. Stop snoring exercises that focus on the lower jaw could have the same benefits as Maxillomandibular advancement, a surgical procedure that pushes the lower jaw forward and is sometimes recommended for sleep apnea. To begin, simply use the muscles of your face to push your lower jaw out beyond your upper jaw. You should feel your lower teeth extend beyond your upper teeth. If you have an overbite, this is an unusual position for your jaw. Your overbite could be responsible for weakness in the muscles located at the front of your throat. Move your lower jaw forward and back for a count of 10. Afterwards, relax your jaw for a few moments and move it from side to side. You can add another stop snoring exercise to this routine. Using your hand as resistance, try to push your lower jaw down or try to open your mouth. Your hand pushes up to try to keep the mouth closed. The added resistance can help strengthen the muscles faster. You use your larynx, your throat muscles and the tissues of the soft palate to sing. Singing often and loudly is a fun stop snoring exercise. You just might need a little privacy to do it. You can run through the scales; do-re-mi-fa-so-la-ti-do. Focus on a single note; la-la-la-la-la-la. And include other consonant sounds that make use of the upper soft palate; ka-ka-ka-ka-ka. 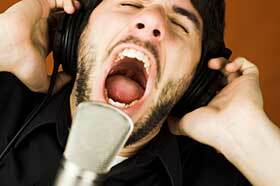 Don’t strain your voice by singing too loudly. Try to focus on using your diaphragm to increase the volume and strength of your voice, rather than simply screaming or yelling. You can do all of these stop snoring exercises twice a day. It is practically impossible to overdo it, except when you are gazing at the ceiling. Be sure not to overextend your neck.